Ultra Slim - 3.5" x 1.5"
4 Round Corners (Diecut) 1/4"
4 Round Corners (Diecut) 1/8"
2 Round Corners (Diecut) 1/2"
Circle (Diecut) - 2" x 2"
Oval (Diecut) - 3.5" x 2"
Diamond (Diecut) - 3.5" x 2"
House (Diecut) - 3.5" x 2"
Arrow (Diecut) - 3.5" x 2"
Bullet (Diecut) - 3.5" x 2"
Bullet - Both Sides (Diecut) - 3.5" x 2"
Can (Diecut) - 3.5" x 2"
Ticket (Diecut) - 3.5" x 2"
Wave (Diecut) - 3.5" x 2"
Businesses print custom business cards because first impressions are everything. 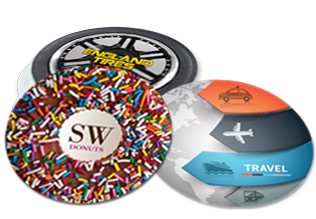 If you are looking to present something fun and eye catching, die-cut circle business cards are the way to go. Always printed on 16pt premium cardstock, our custom circle business cards are a very popular item. If you are printing circle business cards, make sure to download and use our circle business card template before ordering. And if you have any questions at all, contact an America's Printer Sales Rep.